Austin Peay's Governors Stadium is getting a facelift, but a 40-foot-deep sinkhole in the north endzone has made the process a little more difficult. Workers have been aware of the sinkhole for some time, but in trying to make the area safe and workable, they've had to dig out a considerably larger space than they initially found. The hole started at only three-to-five feet wide a few weeks ago, but expanded to 50 feet at the widest and nearly just as deep. Weird as it may seem, a sinkhole at Austin Peay is not totally out of the blue. Due to the limestone caves in the area, sinkholes are an anticipated hazard and the construction company actually budgeted for this very occurrence. The campus even has (now safe) sinkholes scattered all over it. 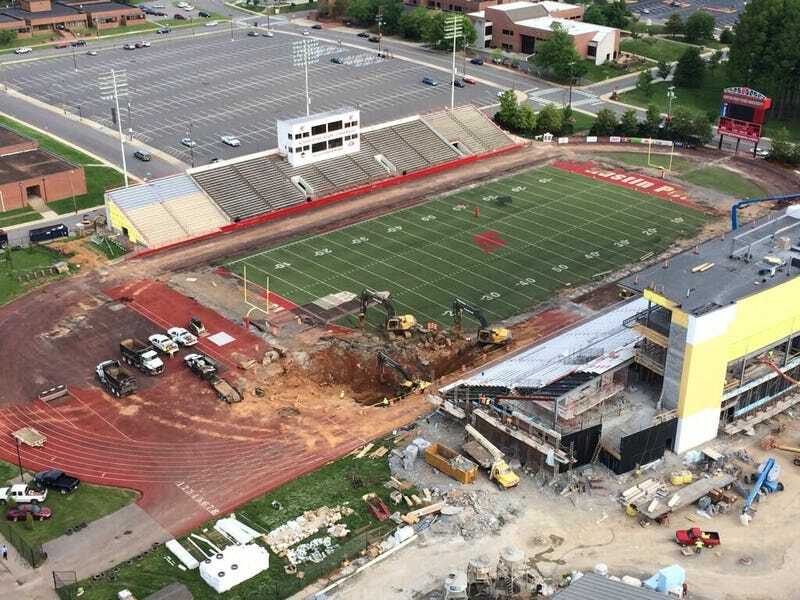 A 40-foot-wide sinkhole has opened at Austin Peay State University&apos;s Governors Stadium. "We're not going to skip any steps. That's the reason I brought the engineers back out because it's not going the way we thought it was going so it's time to let the professionals look at it and tell us which way to go. Once they do that we can just continue the process," said project superintendent Mike Jenkins. University spokesman Bill Persinger said this may not that be big of setback considering how common sinkholes are on-campus. Others have been repurposed into areas students use. "They're actually a main feature of our campus. The center of campus has what we call the bowls, which we've landscaped around as the sinkholes have been remediated years ago," said Persinger. Despite the size and look of this one, the school is not worried—there have been no reports of injury—and expects the stadium renovation to be completed on schedule and in time for the upcoming football season.